High today is 49 with lots of wind! At least it’s sunny but the wind just sends s chill up your spine. Looks like mid 50s tomorrow and Friday with the weekend showing chances of rain and temperatures in the mid to upper 40s. Monday’s chances for rain are less, but that a whole four days away. Temperatures next week are upper 40s early in the week and dropping to mid 40 and upper 30s by later in the week. Generators off most of today. There supposed to be off most of yesterday, but as I always say….the Monday projection is a “crap shoot”. Thursday we will be three hours of generation from 7:00-9:00 and again from 5:00-7:00 p.m.
Stan on the water the day after Thanksgiving with Brandon and his mother Brenda. They have fished with Stan on this day for years in good or bad weather. Very good day for them this year on the ruby 2 midge. Brenda was supposed to send me a picture of her nice fish but I haven’t seen it yet. Saturday, Carolyn took Mike out for most of the day. We started a little late because of the generation schedule and the cool morning. Very good day for Mike, especially early in the day, on the ruby 2 or blue poison midges. As the day went on, fishing seemed to get a little slower and our normal patterns were not working. We changed off to the white grub. Several nice size fish for him that day. How about this beautiful reflection of the trees in the water that I saw this morning! 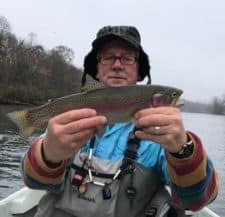 This entry was posted on Wednesday, November 30th, 2016 at 3:58 pm	and is filed under Fishing Reports. You can follow any responses to this entry through the RSS 2.0 feed. You can leave a response, or trackback from your own site.